Located on the doorstep of the Rocky Mountains and the southern plains of Alberta, the city of Calgary is subject to extreme changes in temperature and climate. This wide range of weather patterns can take its toll on your business or office buildings roof. It is quite common in this region to have significant roof malfunction, with little or no warning. When the roof of a commercial building fails and causes a leak inside; the extent of the damage can be significant. A small leak inside may not seem like a costly repair, but for water to have worked its way through five layers of roofing membrane means that five layers are in need of repair. Let us look at the five different layers of a commercial flat roof system. This will be the first membrane placed over the plywood sheeting of a commercial roof. Its purpose is to prevent the penetration of any moisture on the wood decking. Moisture does not always have to come from a leak. Condensation can simple develop through shifts between warm and cold temperatures. Once our vapour barrier is in place, the next layer will be our ISO insulation. ISO insulation provides the building with its insulating value. With a thickness of one inch, ISO insulation can provide an R-value of 6. Most commercial buildings require a minimum R-value of 18. This means we will use three inches of ISO insulation. The third layer in this roof system is our firebreak. This layer consists of a fire rated gypsum board. This will protect the layer beneath from the fire hazards associated with installing the last two layer. The gypsum board is also essential because it provides a smooth and flat surface preventing any wrinkles in the membranes to be installed overtop. Now that we have our firebreak in place we install the base sheet. 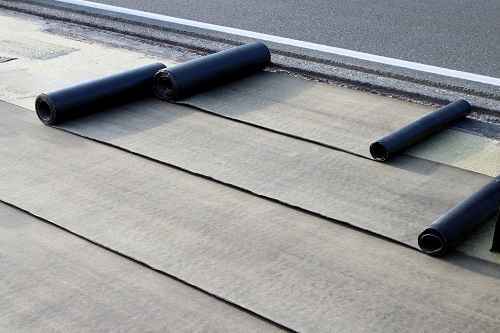 This fourth membrane will be installed using propane torches, which heats up the bitumen surface and allows it to adhere to the gypsum. Once this layer of the flat roof system is installed the roof is watertight. Our last and final layer in a commercial flat roof system is the cap sheet. This is by far the most crucial layer in the entire system. The cap sheet is responsible for withstanding the external elements such as wind, rain, snow and UV rays. Most people do not realize without UV ray protection the materials on our roof’s would simple deteriorate in a short period of time. How Do I Know My Commercial Roof Needs Replacing? Here is a list of signs your commercial roof needs a replacement or inspection by a professional. 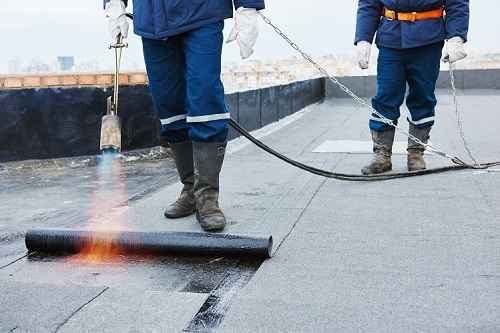 Commercial Roof Repair: How We Can Help? We offer a wide range of top-of-the-line roofing services, including both repairs and full roof replacements. Contact us to find out more about how we can keep your commercial roof working for your company for years to come.